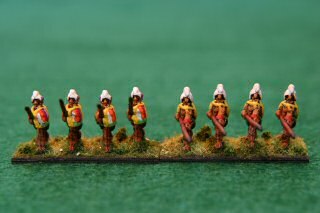 This article shows a miniature army in 15mm scale painted andbased for the miniatures game De Bellis Antiquitatis .Each army consists of 12 stands (known in the game as elements) of 2 to 4 figures per stand.The IV/12 Polynesian Army representsarmies of Polynesia or Melanesia in the years spanning 1100 A.D. to 1785 A.D..In the game they are a littoral people with a low aggression factor of 1.In the DBA game, the Polynesian armies usually battle themselvesor the Indonesian or Malay army (IV/37).These figures are from the companyHistoriFigs. 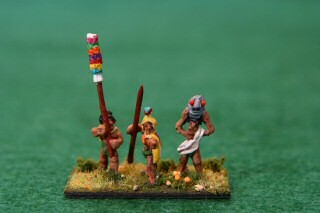 To the right we see the King with the flower pole and tikibearer.I added tiny beads to give the tiki red eyes.The base is flocked with static grass from Games Workshopand bush clumps from Woodland Scenics. 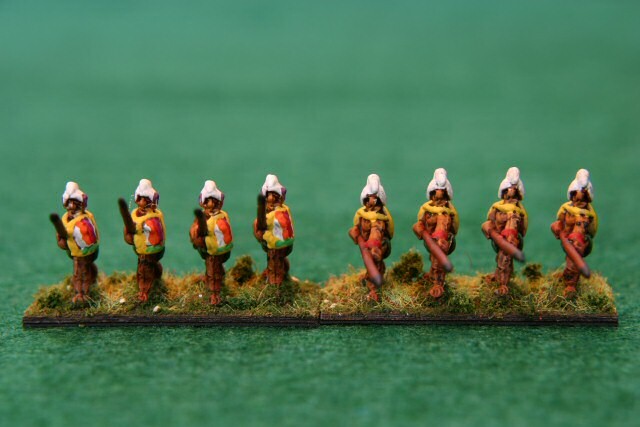 The Polynesian army has four variants. 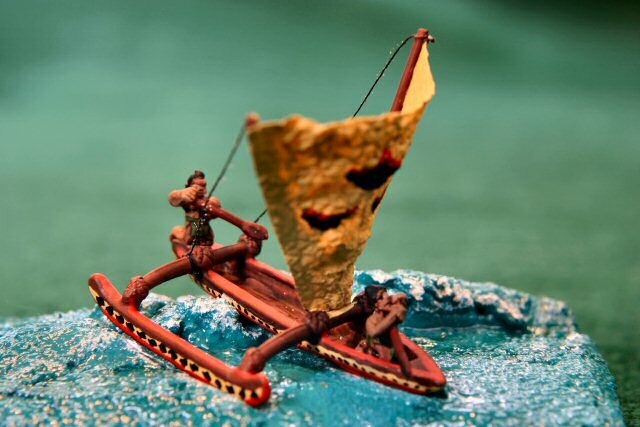 To the right is an outrigger canoe and rowers that come with the deluxe version ofthe Historifigs Hawaiian pack.I hand made the sail from two small (1 mm diameter) dowels and the sail from a paper towel soaked in whiteglue.The base is DAP All Purpose Stucco Patch which is a sand textured spackling paste. I spread iton a basswood base and molded the wave and placed the boat on the curl.I painted the water with Vallejo Azul Verde (number 808 or 070) which I believe should translateas Azure Green, but the bottle says Blue Green.The water is then painted with gloss medium to give it the shine. To the right is a photo of the 2x4Pk pikes.They are only in the Hawaiian army variant, so most people like to play Hawaiians inour club. I painted them with the "magic dip" method described at the Fanaticus site .Basically, paint them with acrylic paints with little or no highlighting or shading.Then dunk the completed figure an the ink-like productsuch as MinWax PolyShades Jacobean or Tudor shade.This product is a stain and polyurethane with a matte finish.Most of it runs off, but some shading is left in the crevices anddepressions giving the miniature a nice three dimensional look.Then I finish them with a matte clear coat to protect the figure.Especially with 15mm figures, this is a quick and easy method to paint an army. 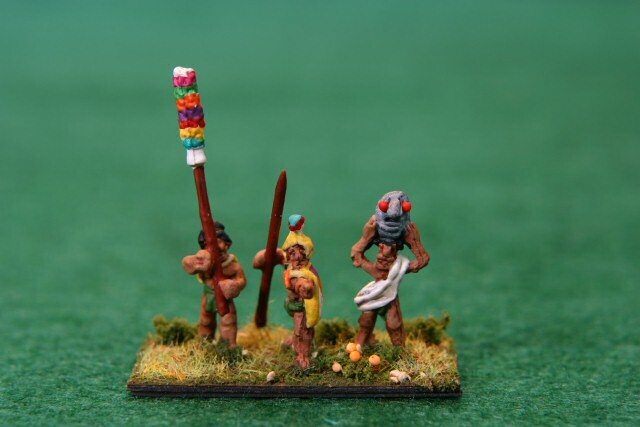 To the right are the Polynesian spears.The Melanesian army variant has 9 of these guys.The Polynesian army is fun to paint because the warriors are festooned withcolorful feathers.Helmets, shields, capes: everything had feathers.This is one chance to use bright greens, violets, hot pinks, yellows.The color selection alone is frightening.Note that some figures have tiny necklaces made from red and orange beads.These are really HO scale apples and orange from Woodland Scenics,but I envision them as 15mm scale hibiscus flowers.Some of the flowers are added to the bushes as well. To the right is are 4 bases of Blades.Hawaiians have 6 bases of 3 blades and Maoris have 11 bases (plus the general).The weapons are clubs, but they have sharp bits of coral and pieces of volcanicobsidian, so they cut like blades. "I ought to join a club and hit you over the head with it," saidGroucho Marx. 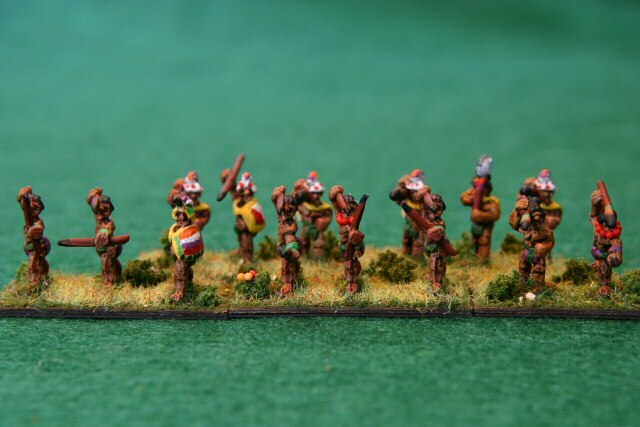 To the right is a photo of 3 stands of 2x2Ps psiloi.These stands have slings and tiny spears.They work well supporting spears and blades attacking mounted troops.They also are great sprinters on the first bound of the game. For the next battle Dan fielded his newly painted HAWAIIAN (IV/12c)army against Jeff's untested ELVEN army (not sure what number, but 2knights, 4-6 bows, 2 psilois, and the rest spears and blades). Oh yes, purists might claim that this is a non-historical battle, butdid you ever wonder where the Elves landed after sailing west fromMiddle Earth? Of course, they knew they were heading to paradise, sothe most plausible island paradise with forests west of Middle Earthwould be Hawaii. So this is not an unlikely battle. We rationalized the Elven Magicians would be equalized by the HawaiianTiki Priests, so magic was not an issue in this battle. The Elven camp followers included a mighty Ent, who hurled bouldersand insults, but was otherwise ineffective. 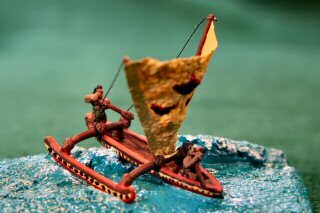 The Hawaiian camp includeda war canoe riding the surf, but was hampered by the tiny pond in thisforest battle setting. Hawaiians attacked. 3 sets of tatooed slingers advanced fast up themiddle and took a nice forest in the center. The Elves advanced theirbowmen up the center as well and killing off a grass-skirted psiloi.On the left, King Mighty Mook took his obsidian blades and encounteredElven spears. Unfortunately, the King does not dice well and wasrepeatedly retreated. 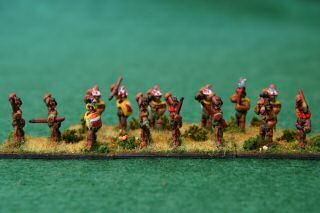 On the right the Hawaiian pikemen scare off theElven Knights who attempt to use the backfield to race to the otherside of the battle. Unfortunately, the Elven King and his horse raced too closely behindthe Elven bowmen. 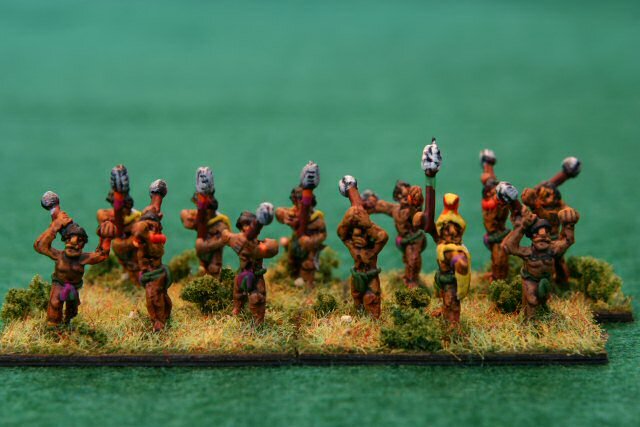 The Hawaiian blades bashed the bowmen forcing themto retreat into their King, driving him off a cliff. Victory for theHawaiians. And that is why Elves are a folkloric fantasy, while Hawaiians stillinhabit their Pacific Island Paradise. Last modified: Thursday, 09-Jun-2011 12:42:06 MST.